John is the “old school” guy in the bunch: he is all about the drag roots from the 1960’s and the early days of big block power. He loves the rewarding feeling of finishing every build and getting each customer closer to their performance dreams. Known for his incredible attention-to-detail, work quality, and fabrication abilities, John loves to put his creativity and expertise into every build to make each project unique to the customer. 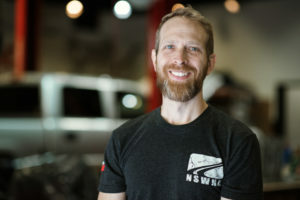 As Senior Performance Technician, John is a continued mentor and trainer for our Performance Technicians, teaching them the advanced methods and skills to ensure our customers receive the best quality possible. In his spare time, John likes to take his family to the dirt track for ATV and two-wheel racing, as well as restoring his Ford Fairlane.